an unnamed infant (-), died at Idle (buried at Calverley, 2nd April 1677). Maud died at Idle (buried at Calverley, 7th July 1703). William died at Idle also (buried at Calverley, 4th May 1716). Rebecca (baptised 17th November 1700), married (at Calverley, 29th September 1729) Adam Story. John (baptised 10th January 1724-25), died (age 2) at Stanningley (buried at Calverley, 7th March 1726-27). Jonathan (a tailor) died at Stanningley (buried at Calverley, 10th April 1738). Mary (-), died at Stanningley (buried at Calverley, 14th October 1746). James (born c.1778), possibly married ? Nancy. Nancy (“Ann”) died (age 67) at Stanningley (18th June 1798, buried at Calverley, 20th June 1798). William died (age 75) at Stanningley also (19th September 1807, buried at Calverley, 22nd September 1807). Joseph (born 4th January 1807, baptised at Calverley, 24th May 1807), died (age 10 months) at Stanningley (buried at Calverley, 24th November 1807). George died (age 34) at Stanningley (buried at Calverley, 18th October 1807). Afterwards, Deborah (widower) married 2. (at Leeds, St. Peter, 8th January 1810) James Keighley (clothier). 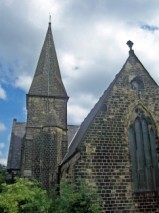 Deborah Keighley died (age 47) at Stanningley (buried at Calverley, 5th December 1819). [HASN651] Thomas Harrison (born 1794), a clothier, married 1. (at Leeds, 12th July 1812) [HUTC652] Elisabeth Hutchinson (born 1793, see HUTCHINSON), witnessed by Joseph Hutchinson (Elizabeth's brother). Elisabeth was just age 19, whilst Thomas was still 17. Their first child Joseph was born at Stanningley (1813). Thomas was not present at either birth or baptism of Joseph, as 8 months earlier he had enlisted at Manchester with the Royal Horse Artillery (on 22nd December 1812, calling himself “Jonathan Midgley, born in Leeds”). He did not return home until March 1818, when he “deserted”. He returned to the army shortly afterwards, taking with him his wife and son. For a summary of his army career from 1812 to 1835 see THOMAS HARRISON'S ARMY CAREER. Ellen Hutchinson (born at York, 11th September 1832, baptised there 16th September 1832), married (at Calverley, 9th June 1851) Henry Atkinson Brown, witnessed by Ann Williamson and William Wood (Ellen's brother-in-law). Henry (born 9th March 1846, baptised 17th June 1849), married (at Calverley, 1st April 1877) his sister-in-law Dinah Hearon, witnessed by Abner Hollings and James Marshall. By the 1851 Census, Thomas was a grocer at Richardshaw, Stanningley in Pudsey. Thomas died (age 63, of a fever and congestion of the brain) at Stanningley (16th November 1857, buried at Pudsey, St. Paul, 19th November 1857). Martha died (age 72, of bronchitis) at Stanningley also (14th June 1875, buried at Pudsey, St. Paul, 16th June 1875). [HASN662] Elizabeth Harrison (born 1820, daughter of Thomas & Elisabeth) married (at Leeds, St. Peter, 28th August 1836) [WODD661] William Wood (born 1818, see WOOD).